Why are Camera Bags Important? Does this situation sound familiar to you? You are getting ready to go on an important excursion into the great outdoors to get some high-quality landscape shots. You begin by starting to pack up your standard camera bag with the equipment you will need to get the crisp photographs you are looking for. Then as you are about half way through packing, you realize everything is not going to fit. What do you do now? Do you sacrifice your photos and leave behind the extra equipment you need? Do you try and jam everything you can in the insufficiently spaced bag? Do you try to grab a satchel to carry your accessories? How will that keep them protected while you are hiking through the elements? There are solutions to this issue, so now you do not have to worry about leaving anything behind again! How Does a Professional or an Amature Photographer Deal With These Problems? All these are possible situations that will come up at one point or another if you are a photographer. This can be a terrible pickle to be in, especially if you are a professional photographer. An issue like this can potentially cause you to lose money or even ruin your career. The last thing you need is to have a major client requiring the photographs they ordered and not being able to deliver them on time. Making sure that you are prepared for anything that life throws at you is a key factor of being a great photographer. What Should You Keep in Mind When Traveling With Your Camera? Many photojournalists and freelance photographers will frequently travel to capture spectacular images of landscapes all throughout the world. They will stay in a variety of different places while they are traveling all over. Hotels, motels, bed and breakfasts, camping, some will even look for homestays or rent a room for a short while. This is an excellent way to learn more about the cultures that you will be experiencing and the people you will be interacting with during your visit. If you have ever traveled or gone on vacation, I am sure you know how hectic it can be and just how hard it is to remember everything all the time. Don’t let your amazing adventure turn into a sour experience by forgetting your film or other equipment behind. No one wants to lose these things or have them stolen. Even if you are working, the benefit of flying around the world is enjoying yourself while experiencing the foreign population and their culture. Don’t Forget To Grab Your Camera! Leaving your phone behind at a restaurant or a bar is something that happens to many people. You are trying to relax and take a load off when you put your camera down on the bar or in the booth on the seat next to you. After having some excellent cuisine and a few drinks, you grab your jacket and hail a cab back to the hotel. That is when it hits you like a ton of bricks. Your camera is still at the restaurant. This is the worst nightmare for professional photographers. Losing everything that you have worked so hard to capture with your lens. A comparable situation would be an artist having someone put a fist through his or her freshly painted masterpiece. A devastating and unfortunate event that could have been avoided by using a camera bag. Losing a large camera bag would prove to be much more challenging than losing the camera itself. What Can a Photographer Do to Prepare For Poor Weather Conditions? Running into inclement weather is not something you can always plan for. If you find yourself caught in the harsh elements outside of your home or anywhere around the world, what can you do to ensure your camera and gear will be protected? This is another nightmarish, yet common situation that any photographer would hate to find themselves in. With damaging your device, this could leave you with no photos or even worse, without your camera. Let’s have a look at the different types of weather that a a photographer should watch out for? Dust can be very unforgiving and can ruin any shot you try to take with your camera. There are several areas that dust likes to acumulate on your device. The lens is by far the most common, and can potentially be the most frustrating. If you find that dust has started to develop on your lens trying to clean it yourself can prove to be quite challenging and time-consuming. Your sensor is another dust magnet that can cause serious problems if it gets too dirty. Some cameras give you the ability to use a self-cleaning option or give you the option to clean the sensor yourself. Older cameras and some cheaper one’s won’t give you access to the sensor. This means the only way to clean it is by going into a servicing center to have someone else clean it for you. Having your digital-camera professionally cleaned can prove to be expensive, especially if you use the camera frequently in areas with significant amounts of sand and dust. The beach or the desert can be breathtaking places to shoot but can leave your camera in bad shape. Don’t let your camera fall victim to its arch enemy known as dust. Honestly, preventing any unnecessary build up is by far the easiest way to combat dust particles from ruining your pictures. Do you live along the coast or in a tropical climate? If you do, you probably know how detrimental moisture and humidity can be on electronics. How do you protect your photographing equipment from an element as damaging as this one? Keeping your camera in a waterproof bag can help you avoid moisture related issues that will affect your device negatively. Transferring your camera from a cold environment to a warm one in a short time can make your cameras lens fog up. This will ruin any images that you try to shoot with your equipment. Furthermore, if the inside becomes moist or wet, the electronics can fry and short-circuit, causing you to lose everything. Remember to protect your camera by using a moisture/waterproof bag. Most likely, you already know what kind of damaging effect rain can have on any electronic device. However, one of the best times to catch great lighting effects and get some great snapshots is when it is raining outside. This puts you as a photographer, in quite the predicament. Do you just let your camera get wet in order to get fantastic photos? How would that be beneficial? Even if you did get some great pictures, your camera would be ruined. Is it worth the expense of getting a new one? Don’t put yourself in a situation where you would have to choose the safety of your device over the quality of your film. A waterproof camera bag can prevent this from being an issue! Hail is not something that most don’t think about when talking about weather that can damage your electronics. Typically, you would be more concerned about the rain, or the moisture in the air. However, hail storms do occur and finding yourself stuck in one with no way to protect your camera can be a scary thought. You are trying to take pictures while having a great time and then you start feeling ice pellets smack the top of your head. Don’t try to play dodge the hail coming at your device. Make sure that it is protected! The security of your camera should always be the number one priority of any photographer, especially an adventure photographer. Similar to when it rains, snow can create beautiful pictures where the light dances off all the reflective snowflakes. With such a stunning outcome of these kinds of photos, snow and cold climates are becoming very popular sites to shoot. Unfortunately, cold can be very rough on the electronics your camera relies on for quality pictures. The plastic that is used to create the shell of your camera is meant to be slightly malleable, so the plastic will bend instead of breaking if it bangs up against something. When you are dealing with frigid temperatures, the plastic will harden and bending won’t take place in the event of an accidental bump. Shattering a camera in icy weather becomes much easier the colder the device gets. The LCD’s can be adversely affected by the cold as well. The color displayed on the electronic can lose contrast. This will make it quite challenging to see what kinds of pictures you are capturing and what you need to adjust to get the perfect shot. Batteries in the camera will also start to lose their charge and won’t perform for as long. Dead battery cells will devastate a photo shoot and interrupt the flow of your work. Heat can be damaging to your camera, but that is not what most wildlife-photographers worry about. Instead, their primary concern is usually the heat waves that distort pictures. If you have ever driven down a road in the summer, I am sure you’ve noticed the road will become slightly distorted in the distance. This distortion is caused by heat waves bouncing off the asphalt. This is common in a warm climate but can cause so many problems if you are trying to take a decent picture. These waves of heat can alter the actual shot and even change the colors that your digital camera will pick up. For the electronic inside your device, they can overheat and start to malfunction when left in high temperatures. Camera bags come with insulation that can help keep your tech cold in warm weather and warm in colder weather. The ocean is and always will be a favorite of almost any artist. Being able to grab pieces of the exotic world and share them with others is what landscape photography is all about. Making the viewer want to be there and believe that they can reach it can be difficult to translate using just a picture. If done right, landscapes can be one of the most inspiring forms. You might be wondering how a landscape artist actually accomplishes these takes with their digital-camera. How do they keep them from getting wet? How can you protect all your gear? How do you even get to a great place to take ocean shots? These are all reasonable questions that anyone wanting to use a camera around a large body of water should be asking. You can actually protect all of your gear using waterproof bags and covers for your equipment. Some are meant to provide more coverage than others depending on what kind of water you will be around. Heavy rain is not as difficult to protect against as water from the ocean. Rough waves will crash up against your vessel and leave you drenched. Make sure that your gear is safe and contained in a waterproof bag. What About Those Who Hike Through Rough Terrain? When hiking on any trail, you will come across obstacles that can negatively affect your ability to take pictures or even reach the place you were hoping to shoot at. Hiking can be very dangerous, with cliffs and drop offs, making sure you are safe comes first. Carrying your camera around through the woods or jungle might not be the best idea. If you were to slip or trip over something one of two things is going to happen. You could end up dropping your camera or smashing it against something causing severe damage to it, or you could fall and cause serious damage to yourself. Don’t leave yourself unprotected and vulnerable in these kinds of rough conditions. Use a hefty camera backpack to help keep you and your equipment safe and sound. Camera bags are outdoor photographers saving grace when it comes to protecting their most valuable possession, their camera. You would not put a computer or a laptop through these same kinds of conditions. Essentially, your high-quality photography equipment is just as vulnerable as any other electronic device. So why would you leave it exposed to such harsh conditions? By using one of these bags or backpacks, you can prevent any serious damage and extend the life of your digital-camera. Digital photographing technology is very expensive. Why not save your money by protecting your belongings with one of these camera safe bags. The AmazonBasics SLR/DSLR backpack is terrific for your camera and its many accessories. This pack has proven to be a favorite amongst those in the film and photography industry and for a good reason. The simple design is incredibly easy for anyone to use. The many different compartments that you can find in this bag will hold all of your different electronics and gear that you will need for a successful photo shoot. The use of sturdy polyester and durable nylon ensures that the bag won’t rip or tear easily. Leaving you with less to worry about while hiking through the woods to your favorite spot. The front pocket has storage space for a folder or a small laptop that you might need to bring along with you for on the spot edits. Straps on the side allow you to carry a tripod with you. For those who shake or have tremors, this feature can be quite helpful. Lugging around your tripod is never fun, and this could help eliminate that frustration. Possibly one of the best features this backpack has would be the amount of padding it provides along your spine. The additional cushion will help with discomfort while carrying the bag when it is full of equipment. The straps that sit on your shoulders also provide plenty of padding to keep additional stress off of your shoulders. This definitely helps when taking high-quality shots and you need to be able to maneuver quickly. The compartments this bag utilizes will provide any additional cushioning necessary to protect your multiple camera bodies and any add-ons you might need to bring along. With straps running back and forth on the front of this bag, you can bring water or a snack with you conveniently on your next excursion. All in all, this is a great beginners backpack for adventure photographers and wildlife enthusiasts. The SwissGear Travel Gear ScanSmart Backpack 1900 is a perfect fit for those of you who are concerned with carrying your laptop with you while making sure to protect your valuable belongings. With several different colors you can choose to purchase this bag in you can customize it to fit you more personally. This bag comes with many different pockets and zippers. Any and everything you will need to bring will be conveniently cradled in its own designated pocket. Worrying about packing fragile things together can now be a thing of the past. There is even a pocket for your phone, so it will stay safe while you are hiking, running or even climbing to dangerous heights. With the use of polyester, this pack will support whatever will be traveling with you. SwissGear designed this with the ability to carry up to a 17″ inch desktop or laptop, and a separate compartment for your tablet too; you can bring all your electronics with you now. Zip them up in the additional mesh protective pockets, and you can relax knowing that your devices will not be bumping up against each other while you are jogging or running while out exploring. If you are someone who travels a lot, this particular pack is designed to come apart and lay flat for x-ray conveyer belts and any other airport security procedures. What if you like to jam out and listen to your tunes while you are out exploring? SwissGear made sure to offer a solution for this. There is a small gap that leads from the inside of the bag out through the top right next to the handle. Now, you do not have to choose between the security of your phone or mp3 player since you have a specially designed protective pocket for your device. This bag will provide much comfort and protection for your valuables especially while traveling frequently. What if you suffer from back pain or even just don’t like to use standard backpacks? What can you use that will have all the support and functionality that you need for your camera gear? AmazonBasics has introduced a solution for those with these problems. The AmazonBasics Large DSLR Gadget Bag has a variety of featured pockets and protective cushioning to keep everything safe. What Features Does This Satchel Style Bag Have? With the supportive handles and straps, you can easily carry it around or strap it across your body for hands-free use. There is room for one large bodied and a small bodied camera, and then additional lenses and accessories. This bag provides stability and organization for any professional out in the field. You even have a place to put a tablet or a phone without worrying about cracking the screen. Plenty of added space for memory cards, pens, cables, and even straps for your tripod helps so there are many different ways to pack up your things. Small pouches are provided for you to safely store batteries away from everything else. When you first open the bag, you will notice that the roof has velcro attachment to provide an extra hiding space. You can use the extra dividers that come in the kit to customize your compartments for your own needs or use them to provide you with additional padding. Organize your large travel camera bag the way you desire. These style camera bags usually do not offer enough space for everything a hobby or professional photographer needs. However, the Large DSLR Gadget Bag has enough room and customizable pockets for any photographer to carry everything they require. The Canon Deluxe Photo Backpack 200EG for Canon EOS SLR Cameras was specifically designed for professionals. If you are not a professional photographer, this is still a great option for protecting your expensive gear. What Does This Backpack Have to Offer? The medium sized bag makes bringing your belongings along with you anywhere you go a pleasant experience. Three main pockets form the majority of the pack where you can store as many as two different large cameras along with your other tech. Three additional slots for your memory cards makes switching them out simple. Don’t spend time rifling around in your bag, just to end up dumping everything out. What is in the Main Camera Compartment? Two large compartments located down the center are meant for two large DSLR’s. Six smaller sections make up the two sides. Three parts on the right side and three on the left. These are the perfect size for a small digital camera, extra lenses, and anything else your heart desires. Velcro allows you to adjust or remove any cubbies allowing you more storage space. Cubbies for drinks and snacks can be vital when you are hiking down a trail or exploring the wilderness. This pack ensures that you will be able to carry all your electronics and food/drink for when your belly starts to grumble or when your throat is dry. This bag is perfect for those who have a lot of accessories that they need to bring with them for their photo shoots. Carrying all of these items can be troublesome when you only have a small satchel. Using a much larger pack can help you carry and keep everything safe while you are outdoors or while you’re traveling. Even if you are just headed into the studio, the Canon Deluxe Photo Backpack can be perfect for keeping your devices as safe as possible. The Canon 2400 SLR Gadget Bag for EOS SLR Cameras, has been growing in popularity amongst traveling photographers who prefer the convinience of a shoulder pack. A velcro handle at the top of this satchel style bag gives you added security. Knowing that there is no way that the handle will slip, you can be assured that your camera is safe. The over-the-shoulder strap can give you the added security that your bag won’t get left behind. If you are traveling and will be visiting crowded tourist attractions, this sturdy strap can keep someone from ripping your camera out of your hands and running off with it. Like most other camera bags, this one comes with many different cubbies for your accessories like lenses, memory cards, batteries, and cords. Up to five lenses can be stored at once safely. Keeping everything you need safe and sound in one convenient location is the primary function of this camera bag. The different cubbies can be changed or adjusted here, or even completely removed, leaving just the shell. Nylon, the water-repelling fabric, is used to in case your valuable electronics where they will be hidden away from rain, snow, or hail. This bag still isn’t completely water-proof so don’t go trying to submerge it in your bathtub to test it. It is meant to help protect against standard rainfall, not carrying your camera to the bottom of the ocean. For what it is, this bag is an excellent choice for photographers on the go. Sturdy and comfortable to wear for extended periods. Making sure that you can protect your gear against average amounts of inclement weather and with offering space for everything you need, this is a great purchase for everyday use. When Case Logic introduced the SLRC-206 SLR Camera and 15.4-Inch Laptop Backpack, they were fulfilling a much needed new invention in camera bag technology! This pack comes with a plethora of exciting additives. If you are outside around dirt and sand frequently, the bottom of the bag is made of malleable plastic. The plastic will keep all your electronics safe from dirt, dust, and sand residue. The first feature you will notice about it can be found on the outside of the bag. Two straps located on the side, provide storage for all sorts of sized tripods. If you are someone who uses a tripod on a nearly daily basis, this would be a match made in heaven. Since the stand is strapped up on the side, you will not have to worry about the tripod getting in your way while you are wearing this pack. When you open it up to look in the primary inner pouch, you will notice a large cavity at the top of the bag. This is meant for your SLR to keep it up from the bottom of the bag. It will basically cradle your camera, and protect it from bangs and bumps that occur when putting your bag down. A stretchy velcro strap gives added protection when you are hiking with your camera to get some great nature photos. You might be a photographer and editor. In that case, this bag has all the features you need. A laptop portion for a computer a little bigger than 15 by 10 inches will come in handy. Most editing laptops tend to be on the larger end. This means most camera bags won’t accommodate the size require for your computer. Case Logic’s SLRC-206 SLR Camera & Laptop Backpack can give you all the space you need and more. I’m sure you remember when the those really cool new backpacks came out that had a single strap that crossed over the chest. Everyone had to have one. The appeal of only using one strap seemed less secure at first but has proven to be a top contender in protecting your belongings. 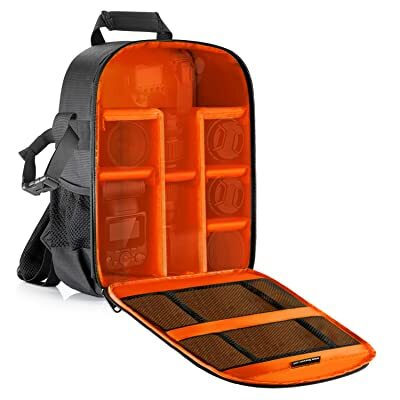 Lowepro utilized this innovative camera backpack design to accomplish several things when the Slingshot 102 DSLR Sling Camera Bag hit the market. Providing more freedom for you to move around, this bag can be helpful if you are always on the go but need to have free range to capture those high-quality images you’ve been looking for. You can use the plastic buckles to strap the bag around your waist to keep the bag from bouncing around. There are more fasteners attached to the front to prevent the bag from coming open while you’re running down a trail or jogging after an exotic bird. The one strap design surprising provides plenty of comfort. Additional padding has been applied to the strap so you can wear around all day without neck or back pain. This bag may not be the largest when looking on the outside but has a ton of space on the inside. There is one large section for your camera and three smaller sections for your accessories. Another pouch is located at the top of the bag which can be perfect for snacks or even a smaller digital camera. With all the little cubbies and crevices, you will find new hidden pockets almost every time you start to pack. On the bottom, there is a zipper that when opened, will release the weather protection cover. This will keep everything in your bag safe in case of a heavy downpour. The Canon Deluxe Gadget Bag 100EG is perfect if you are just starting out as a photographer. You probably have one or two cameras and a few lenses to start out with. In this situation, you most likely do not need such a large camera bag if you are only going to be carrying around a few things, but you still want to make sure that your new toy is going to remain safe. Keeping yours in a traveling camera bag can prove to be very helpful when trying to protect it from dings, scratches, and rain. Canon has come out with some great camera bag designs for adventure, wildlife, and landscape photographers. This one, in particular, provides excellent support for a beginner or even a professional who doesn’t want to lug around a big backpack while they are exploring the great outdoors. The clips this satchel uses to hold the top of the bag with are made of metal. This is particularly useful if you do a lot of outside photography since it won’t break from overuse or incident. A removable long strap means that if you plan on carrying your bag, you don’t have to have a long, bulky strap dragging behind you. Possibly the coolest feature of the Canon Deluxe Gadget Bag would have to be the waist belt. This bag will basically turn into a fanny pack. This will make it so much easier to travel with. Hiking through trails in the woods becomes a leisurely experience where you can pull your camera out at any time to get the perfect pic. Adjustable dividers is a pleasant surprise when you open the top. Organize your bag to make it super easy and convenient so you can go out and capture those amazing photos. If you enjoy photography so much that when your friends come over, they think they are at an electronics store, then a pouch set for your DSLR camera lenses might be something you should look into. Altura Photo Thick Protective Neoprene Pouch Set for DSLR Camera Lenses are a great place to start. Whether or not you are planning to use them to protect your lenses from the elements or to protect them from your cat, these are perfect for making sure your expensive camera accessories are always safe. Being sure that your camera lens is protected separately from your bag may not seem like a necessity. For a primarily outdoor photographer, these can be your saving grace. Lenses are one of the most common places that dust and dirt like to collect. Dirt, dust, and sand particles can build up and potentially ruin the perfect shot. When you are out in the world, it is impossible to know what is always going to happen. Using these pouches can save you from spending tons of time and money cleaning your lenses. Even if you do not have a wide variety of camera lenses, you can use these pouches to hook your lens to your belt or pant loop with ease. This provides less effort you have to put in when changing them out. Excellent for the use of traveling and if you need to take pictures quickly. Don’t stress about having to go through your camera bag to find what you need. There are also drawstrings at the top of the pouch so you can close the bag entirely. Plush inner lining softly cradles the lens in the hammock like bag, preventing any and all dings and scratches from taking place. The Camera Lens Pouch Set by Altura Photo is an outdoor photographer’s best friend. Instead of spending your time and money on cleaning and cleaning services, invest in a camera pouch set. Then, you won’t have to worry about the cleaning expenses. If you decide that the Lens Pouch Set by Altura Photo would be a good fit for you, you can pair it with the AmazonBasics Large Point and Shoot Camera Case. Even though the name implies the case is large, this is small and super convenient if you want something simple. Perfect for situations where you are on to go and need something small and quick to get the job done. This camera pouch can provide the protection you require paired with the ease of being travel sized. This particular bag was designed to help protect against normal wear such as scrapes and scratches. With enough room for a large point and shoot camera, (that’s the ‘large’ part of the name) you can use this for almost any occasion. If you are the kind of person who does not like feeling restricted by big and bulky bags, this case can give you the much-needed freedom you have been searching for. You might be concerned about if it will provide enough space for the essentials that you might need to bring along with you. Extra pockets for your charging cable and memory cards can fulfill this important quota. You might not need anything oversized with all the bells and whistles to cart your camera around in yet. You should take a look at the Large Point and Shoot Camera Case by AmazonBasics and see just what it can offer for you. Not everyone will be satisfied by a travel size bag with enough room for a single camera. For those of you professionals and aspiring photographers with loads of extra equipment, finding the Lowepro Flipside 300 DSLR Camera Backpack can seem like a daydream. You might want to pinch yourself to make sure you’re awake. Comfortability and convenience are the main functions this bag has to offer. You can pack this bag full of supplies and accessories for your photographing needs. Some photographers prefer to keep their lens attached to their DSLR while it is packed away for safe keeping. This can be helpful if you are trying to capture a moment quickly, but it can be difficult to find a something large enough while still keeping your camera protected. That is what Lowepro has been able to accomplish with this stylish design. Never worry about missing the perfect shot. The travel camera backpack by Lowepro has a small, removable pouch placed inside at the top to give you more space for your accessories while keeping them away from your precious DSLR. You can pack your batteries, cables, memory cards, lens duster, and anything else you might need. For those of you adventurous souls, the Flipside 300 comes with a mesh side pocket for a drink while you are out hiking trails. Using the removable waist belt option and the sternum strap, you can be sure that your equipment is not banging up against each other if you need to do some unplanned jogging, jumping, or climbing. Going to be around water? No problem! The water resistant fabric this backpack is made with will keep moisture and water away from your valuables. This it the ultimate pack meant for outdoor photographers. Case Logic’s SLRC-202 Medium SLR Camera Bag is what every professional and aspiring photographer would love to use. When first looking at this particular bag, you might think, “that is a pretty nifty looking lunch box.” Once you open the top of the box-shaped bag, you will notice it has many compartments for small and large items. Sturdy nylon fabric will protect your valuable electronics from the weather while outside. A durable outer shell is ideal for keeping your SLR safe and sound. Hard rubber on the bottom can eliminate water and dirt from soaking into your bag if you need to put it down on the ground. With reinforced stitching around the entire case and the zippers, ripping and tearing your bag would prove to be a challenge. The memory foam inner lining will delicately clutch your devices for secure storing. A neoprene hammock will support your camera and an attached lens so you can keep the two intact while put away. This is meant to protect your SLR from the impact of hitting the ground when putting your case down. The suspended system provides convenience and security. Padded handle and strap make it comfortable to wear for short and extended periods of time. Including the two pockets on either side, you will have more than enough storage for your additional gadgets such as multiple lenses or a smaller portable camera for emergencies. On the back, it has a small space for a notebook and pen, or maybe a map of the area you will be exploring. This sturdy case comes in a couple of colors, so if you are tired of all the black bags, you can choose something a brighter. Whatever you might need this bag for, it can accommodate you. If you are in the market for a small, advantageous traveling camera bag, then the Evecase Digital SLR / DSLR Professional Camera Shoulder Bag should be your next purchase. Pairing the fitted design with the stability of nylon, you can be sure that your pricey electrical gadgets will remain in one spot while being secured away from any elements nature will throw at you. These bags can come in several different colors including gray, light blue, and a bright, beautiful burgundy. If you are tired of all the black camera bags you already own, adding some color into your pallet will be a favorable change. Side pockets and front zipper pockets make it a time-saver when you are in need of a quick memory card change. The side pockets are perfect for items like lens caps. No longer will you need to make a choice between convenience and protecting your lens. While trudging around outdoors, this can be incredibly helpful for keeping your glass clean from dust and dirt particles. Even though this bag may look pretty small, do not let that fool you. This case has all the space you need for multiple lenses, batteries, memory cards, cords, cables, straps, caps, and more. If you are looking for something compact yet spacious, this would be the kit for you. Like most other electronic satchel bags, this one can provide you with a weather-safe outer shell to keep your things dry. Evecase wanted to make sure this would be a perfect fit for an amateur or even a professional. After using this bag once, you will not want to use anything else for your compact traveling needs. You might sometimes land a gig that requires plenty of equipment. Well, you don’t have to leave anything behind, as long as you have this backpack. It features a spacious design, which can comfortably accommodate and protect 7 lenses, 2 cameras, a tripod, a laptop as well as other accessories. In short, it can hold almost every tool that you will need in the shoot. It also comes with an extra shoulder bag, which you can use to carry a short lens or even a camera. You can use the additional small bag as a handle bag or waist bag. One of the most important roles of a camera backpack is to protect your equipment. Without adequate protection, your equipment is exposed to all sorts of damage as well as wear and tear. Well, this camera backpack for DSLR is made of sturdy, water-resistant, and tear resistant nylon, making it extremely portable and durable. It also features additional rain cover, thus making it perfect for outdoor photography when hiking, traveling, or backpacking. The TARION Pro PB-01 camera backpack comes with a shoulder strap that you can adjust according to your preferred height. Furthermore, the EPE padded dividers are also adjustable, which means that you can customize them according to the gear that you want to carry. This backpack is compatible with a wide range of cameras, including Sony, Canon, Nikon, Pentax, Olympus, as well as other photographic equipment. If you are an ocean life and sea photographer, there aren’t as many options out there to keep your things safe from water. Even if you are not a photographer, you still might need something to protect your devices from the water and moisture while exploring the ocean. When dealing with such expensive electronics, you need to make sure they will remain dry in the wettest of situations. One rouge wave bumping into the side of your vessel can leave you with no photos and without a working camera. That is just not acceptable, and Earth Pak felt the same way. That is why they introduced the Waterproof Dry Bag. As long as you remember to roll the top three times, this bag will withstand large amounts of water while everything inside remains dry as a bone. This small, one shoulder sack is the ultimate tool when going on vacation. If you don’t need anything large or fancy to carry your things around in, this cool little accessory can save you a lot of money you would otherwise spending to replace all of your equipment. In addition to the waterproof design, this shoulder bag comes with a waterproof phone case. There was even an instance where someone had lost his or her phone in the ocean. They were able to use location software to find it their phone the next day. It had washed up on the shore several blocks away from where it was originally lost. The phone was completely dry, damage free and in the same condition it was in when they had originally lost it. With results like that, why would you not purchase this for your next water-related excursion? The Canon SLR Gadget Bag For EOS or Rebel Cameras has been a topic of debate for a while now. Many users find this bag to be very large and spacious for all the things you might need to bring with you. The Canon Rebel Bag can be used to carry a wide variety of different things. The primary user this case is perfect for photographers. If you are a studio photographer or prefer the great outdoors, this bag can provide you with compact space and is easy maneuverability. Whether you are up in a tree trying to catch a picture of an exotic bird or just taking pics of products for a client in your cushy studio, this case will accommodate all of your needs. Having the ability to store several lenses, a camera body, and a plethora of add-ons means there is nothing you can’t bring with you. There are cubbies and pockets for cords, cards, flash drives, phones, lenses, lens caps, multiple batteries, straps, and more. The plastic buckle on the front will keep the lid closed, so on a hot day or in a warm climate, you can unzip your bag and provide airflow to your electronics. If you work in a warmer or more humid area already, you know how crucial it is to protect electronics from overheating. The Rebel bag can give anyone something they would enjoy frequently using with minimal issues. Simplicity can be the best design when it comes to a great camera case. Pick up one of these bags and see what all the hype is about. Any photography enthusiast would love to use the Acuvar DSLR Camera Backpack. Whether you enjoy taking pictures as a hobbyist or use photography as a means of making money, this particular design can give you everything you need. You can fit basically any and every accessory you might need in a pinch. With the use of removable Velcro inserts, you can quickly adjust or adapt the compartments within the pack to whatever specifications works best for you. Two inner zipping pockets are perfect for your memory cards or batteries. On the very front of this travel backpack, there are separate zipper pockets for anything else like cords, cables, or a granola bar for when your tummy starts to rumble. On the side, there are two additional straps to hold a number of different style tripods. If you use a large tripod, I would recommend getting a separate tripod bag to go along with this backpack. When hiking through treacherous terrain using the extra straps to securely fasten your pack to your body can provide additional support. When dealing with expensive electronics such as these the security of your items is crucial. This stylish camera carrying bag also provides a weatherproof cover. If you find yourself caught in a storm in the middle of the woods, don’t stress. You can simply open the bottom and pull out the protective cover. It is large enough to fit around the entire bag to assure you that your electronics will remain safe and free of moisture. So, even if your photographer or need a bag for your video camera, the Acuvar DSLR Camera Backpack has plenty to offer. Try it out for yourself and see what people have been talking about. For explorers and backpackers alike, the DSLR Camera Backpack Bag by Altura Photo (otherwise known as The Great Explorer) is one of the markets best options for rough users. Reinforced stitching everywhere, including the handle, is great if you tend to put more wear and tear into you items. For any occasion, this bag can be a perfect fit. A headphone opening that reaches into the bag means that if you are planning on listening to your favorite jams, you can keep your phone or MP3 player safe as well. When wearing your backpack, if you usually sweat a lot or are working in a warmer climate where sweat is a natural problem, the breathable mesh design creates airflow between the pack and your back. The sternum strap has adjustable clips and buckles to provide the most comfort while on long explorations. If you flip the bag upside down, you will notice a compartment that houses an extended pouch. This extra portion is used along with the side cubby to create a structure for holding various sized tripods. This super convenient feature will allow you to bring a tripod if you shake a lot after filming or taking pictures for a while. Trudging through the woods, climbing under broken trees and over decent size boulders; bringing a tripod has never been an easy task-until now. This pack provides more room than most would ever need. With the ability to carry two camera bodies, five lenses, and still have extra space, why would you ever need another travel bag? A secondary mesh inner zipper lining also reinforces security. If you have ever owned a bag where the zipper will randomly fly open, this camera backpack by Altura Photo has already thought of a solution. Case Logic’s DCB-308 SLR Camera Sling bag has taken the idea of camera travels bags and revolutionized them. This sling bag is possibly one of the most helpful bags for professional photographers. The SLR Camera Sling has a single strap, over-the-chest design that provides comfort for your shoulder and neck. What is so ‘innovative’ about this? The real amazement here is the swing around feature. Never take your pack off again to grab your camera. Just rotate the pouch around to the front of your body, and the main compartment is accessible from the side. You can quickly unzip the case, and pull out your camera so that you will never miss the perfect shot again. Inside the bag, you can still adjust your cubbies with velcro inserts so whatever you need to bring will fit snug. If you like to stay organized, so you know where anything is at the drop of a hat, this would be a perfect match. What if you are planning on climbing and can’t afford to have the bag always swinging around and into your way? A secondary buckled strap can be adjusted and applied to provide you with a secure backpack that won’t get in your way. A pocket at the top of the bag will have a waterproof cover that you can drape over the bag. Since this cover is removable, you can get it to fit however you want without the restrictions of it being attached. You can even fit snacks or your phone and keys in the top compartment with the pack’s water-resistant poncho. The next time you go out with your old photography bag, think about how awesome it would be to have your camera and accessories ready to go at any moment. Are you tired of all the drab black camera bags? If you are a photographer, then you are also considered an artist. Black might not always match your personality. 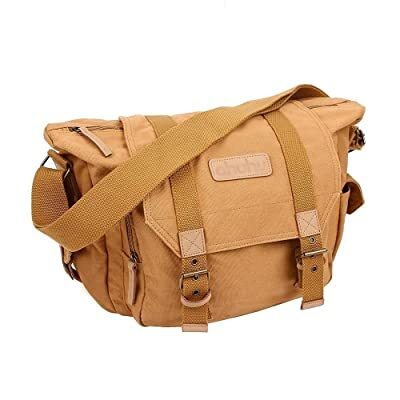 Kattee Men’s Canvas Leather DSLR SLR Vintage Camera Messenger Bag is a super stylish alternative to standard camera bags. Even though this bag looks cool, you still need one that will allow you to safely cart around your camera body and all its bells and whistles. With a removable camera pouch, you can bring with you whatever you might require. Since the padded camera section can quickly be removed, this bag would be perfect for a photography student. Take the padding out, and you have a standard canvas messenger satchel for your books and binders for school. This pouch might not be a perfect fit for everyone; however, it can offer something other bags cannot. Style. You might be more concerned about looking great while on vacation or when traveling to a busy tourist attraction. Always look your best while using your camera, and wear this fun and attractive messenger satchel. You can use either the messenger strap or the leather handle to carry around your bag. Tuck the shoulder strap away when not in use so that it will not drag it across the ground when holding it by the handle. When it comes to the style of the bag, genuine cow leather used in making the straps and handles gives this bag a unique feel while remaining versatile. A perfect look and perfect functionality make this bag a powerhouse amongst others on the market. Lowepro has released a revolutionary designed backpack for every occasion. The Photo Hatchback Lightweight Sporty Camera Backpack with Compact for your cameras is a fantastic match-up for photographers who are constantly on the go and living a very active lifestyle. When the name of this bag refers to the ‘hatchback,’ it is precisely the way it sounds. A hatch is located on the lower back portion of the bag. This is great if you are always worried that your camera might get stolen from your satchel or pack. If you did not know what kind of bag this was beforehand, you would never guess there was a secret compartment for your camera to remain incognito. Like a lot of other camera bags, this one too comes with a water-resistant cover. If you slip the cover over the entire bag, rain, and snow can now be someone else’s problem because you are now protected and ready for anything. You can fit so many things into here including your tablet, phone, camera body, lenses, tripod, flash, cords, chargers, and more. Since it uses ultra flex technology, you can squeeze almost anything in, and it will stretch and bend to match the shape. In some cases, you can even bring your laptop along with you (as long as it is not the largest model). The front pockets act as they do in a standard backpack. You can bring folders, paperwork, important documents, well anything really. It is up to your imagination. The hatchback compartment also offers the ability to remove the padded cubicles so that you can fit something other than your camera in there. If you are an adventure photographer, you might need to use your backpack for other things too. This one can offer you that versatility. AmazonBasics came out with their own version of a sling style pack for photographers. Amateurs and Professionals alike can enjoy the features provided by this design. The Sling Backpack for SLR Cameras can swing around the body at a moment’s notice, giving you immediate access to your camera. Ideal for those times you have to grab your camera quickly to capture an unforgettable moment. Sling Backpack by Amazon can be your saving grace when you are stuck between a rock and a hard place. Maybe you are up in a tree or in the middle of crossing a river, both of which are not ideal for removing your pack to grab your gadgets or gear. This bag solves that problem for you. If you do ever need to put it down for something, rubber feet help keep your bag standing up straight. No more will you have to set down your bag and have to pause what you are doing to make sure that the bag remains upright. With enough room to store your main camera body and any additional accessories, these bags are excellent for when you are hiking or if you plan on doing some mountain biking. Most medium and small camera travel bags will only come with straps large enough to bring a travel sized tripod. What if you are wanting to use a larger tripod? Well, this bag has what you need! Extra large straps can house your tripod while you are on the go. Don’t worry about the tripod making it swing around all willy nilly. Just clip the additional securing strap to help keep you bag out of your way when you need to focus. This sling design case can give you what you need and more. Most messenger bags you see nowadays are built just for looks. Weren’t messenger packs meant for durability and convenience? Would you like to have an authentic style one with the sturdiness of a regular camera case? That is what Evecase has done with their large canvas messenger for SLR/DSLR cameras. Using a removable plush inner lining, this bag has proven to be a top contender amongst those working in the field every day. The lining is completely removable to help you with more space for other things you might want to carry with you. Velcro inserts make all the compartments shift to your needs. For laptops, even ones on the larger end (up to 14 inches) there is a removable computer insert for this bag. That does not mean that other things can’t go in this section. Even if you have a tablet or just a folder you need to bring with you, there is ample space available to you. When lugging around your tripod, you have to worry about leaving it somewhere that it might be forgotten or worse, taken. Most other messenger style bags won’t provide a place for you to store your larger sized tripod. That won’t be an issue for this lovely satchel. The straps on the bottom can hold your tripod, so you do not have to. For anyone working in the field on an almost daily basis, a waterproof bag is essential. Purchasing additional water-resistant covers or cases can be a pain. Without knowing exactly what you are getting when you purchase online, having issues with size and functionality can be common. Luckily, this messenger comes with its very own moisture cover, keeping it dry in the heaviest of downpours. This is spectacular news for you and your equipment. Are you the kind of photographer that is tired of lugging around all their equipment? What if you already have all the fancy gadget-bags and you are most concerned about having a something that will safely house one camera and an attached lens? Maybe that is all you are in need of so you can go exploring, hiking or mountain biking and still have your camera right there when you need it. Case Logic has many different designs for their camera cases, but this one is the most desirable to those who need something compact and straightforward. The DCB-306 SLR Camera Holster has made its way to the adult’s table when it comes to functionality and reasonability. For the hustle and bustle of the modern world, this case offers serious protection for an SLR and an attached lens. Featuring this style, Case Logic wanted to create something that would work for the consumer. One large opening so you can quickly grab your camera in a pinch. The base is completely padded for safe keeping of your precious electronic device. The padding will absorb any shock that the case might take in the event of a collision. Maybe you are prone to accidents, or you tend to drop your bag. This sturdy case will help you keep your camera and all its add-ons safe and sound. The easy to use design the case was built to house multiple extra batteries, memory cards, and even multiple of your cables. Since it is constructed using nylon fabric, it will be water and moisture resistant. Case Logic’s DCB-306 SLR Camera Holster is a great buy even for the most veteran of photographers. You might be in the market for something to house your camera and its lens or camcorder but may not be in need of much else. This Large Digital Camera / Video Padded Carrying Bag by eCostConnection is a great alternative to extra large standard travel cases and backpacks. eCostConnection created a very straightforward and standard type bag for anyone looking to carry around their camera or camcorder. If you remove the shoulder strap, you can easily use it as a storage case for your electronics as well. Utilizing both side pockets, you can fit memory drives and your rechargeable batteries if you need. Even if you are just going to a friends house to show off your new camera, this case is ideal for everyday use. Maybe you are a serious professional, and you can fit everything but a few of your lenses or your flash in the usual case you use. This bag would be a great addon for you to utilize. Maybe, you are just starting out, and you only have one DSLR and at most, a few extra lenses and some cords. The top of the case opens up wide to quickly maneuver your items or adjust anything you might need to. Perfect for anyone in the industry, eCostConnection came up with a wonderful little bag that anyone would enjoy using. Why not try it out for yourself. Canon’s 9320A023 100ES Shoulder Bag is perfect for all sorts of electronics. This case was designed for the use of cameras but is also ideal for storing and carrying your camcorder or any other electronic device. Since it is compact and lightweight, it can be taken with you virtually anywhere you go. The top handle can be used as a quick way to grab your case when you are on the go. Sometimes you do not have the option to place your bag down to grab some photos, especially if you are outside after it has been raining or if it is muddy out. A shoulder strap means that you can use it hands-free if you wish. So if you are taking pictures or recording film, you won’t have to put it down. Keeping the case as nice as possible for as long as you can, will extend its life so you can use it longer. Providing you with all the basics that a camera owner requires, if you do not already have storage space for your camera, this is really all you will ever need. The kit comes with an entirely versatile padded inner lining. The versatile part is fulfilled by the removable and adjustable velcro padded insert. Use it to change the cubbies inside to whatever size or shape works best. Built using nylon fabric, the case is resistant to water and moisture so that your electrical devices will stay in tip top performance. If you are currently carrying your equipment back and forth using something not made to prevent moisture from getting to your device, you are playing with fire. One heavy rainfall is all it takes. Make sure that your equipment is protected before tragedy strikes you. Lowepro invented the ultimate solution for adventurers and exploeres to transport their camera gear safely in any situation. Their Photo Sport 200 AW Hiking Camera Backpacks have revolutionized the way photographers travel and just how far they can safely take their equipment. Possibly the best feature of this bag has nothing to do with cameras, rather, what you can bring along with your reagular photography gear. At the top of the pack, there is ample room to bring a change of clothes, first aid kit, food, sunscreen, and pretty much anything a real adventurer would require. You can tighten the top with a drawstring so if you have to pack it really full; there are no worries. You can pull the drawstring as tight as you can and latch the top to securely fasten everything. A section toward the back will zip open to allow for a camel pack of water for easy storage so that you won’t dehydrate. Double straps at the bottom of the bag are meant for a tripod but can also be used for a sleeping bag if you plan on camping out. Waist and sternum straps will fasten together to provide even more security for your things. The waist straps also have zipper pockets on either side to act as a fanny pack. Similar to the sling style bags, there is a side compartment that houses all your electronic equipment and any additional gear. Don’t worry about taking the bag completely off to reach your things. Just remove one shoulder strap and pull the bag around. The side compartment is meant to be accessible when the bag is still being worn. If you plan on being outdoors for a while, you will need something that is waterproof. The bottom of the backpack will open to reveal a water-resistant cover to protect all your things from moisture. Whether you are an explorer or an adventurer photographer, this bag has it all. What if you have a precious or expensive camera or camcorder that you want to be able to bring with you camping or hiking? What choices do you have for simplicity and security? The Evecase Small Shoulder Case For Compact SLR / DSLR is widely known for being a reliable choice for any equipment you need to transport. Being on the smaller end, this is not a bag I would recommend to anyone who needs to carry a lot or a vast amount equipment. For someone who wants a case for a standard point and shoot camera, this one is definitely a good match. With additional space for your accessories, there is more than enough room for the average user. You can fit other things like your phone or wallet, so you only need to bring one bag with you. Pack your additional batteries, chargers, cables, or maybe just an extra lens. This bag can carry almost anything you would need for a standard trip out. Like most other camera cases, there are adjustable inserts to change the cubbies to fit whatever you bought it for. If you need more space, you can just remove the insert completely so you can pack your things and get back to what you were doing. Have trouble with zipping the case all the time? Just use the buckle to clip the top down so you can grab your camera at any time. Even if you just plan on going to a family get together or if you are planning on hanging out with friends, you can be sure that your things are protected. Water resistant and moisture proof, the Evecase Compact will keep your items safe and dry. Any amateur photographers or professionals alike would enjoy using this bag. Do you already have a camera bag and need something that will carry everything else while you are on your adventures? The G4Free Large 40L Lightweight Travel Backpack is an essential for anyone planning on traveling into the wilderness. This bag provides something that most others do not. Easy storage. Once you take everything out, you can completely roll it up and store it away. If you are going to be camping a lot or staying in close courters, this feature will allow you to unpack all your things and still have extra space. Even though it can be rolled up and stored away, this bag is still extremely sturdy. Don’t be afraid to pack it full. This pouch is meant to handle rough situations. Since it is made of tear resistant nylon, the bag can withstand a lot including harsh weather. Water resistant fabric will keep all of your things dry as a bone while you are exploring new terrain. The nylon material also makes it super lightweight so you can travel more easily with less pain. Padded shoulder straps also help relieve pressure because back pain is the last thing an adventurer should be worried about. Larger than most other backpacks, this one can hold up to forty liters of anything you want. Any zippers and buckles will hold up well even if you tend to pack heavier than most. You can even store your camera bag inside. Since it comes in a wide variety of colors, there is a design that will appeal to anyone. The G4Free Large 40L Lightweight Travel Backpack would be perfect for anyone who is looking for a durable, waterproof, easy to use pack for any occasion. If you are looking for the perfect camera bag for going on vacation, you should look into the Koolertron 1533278 Waterproof Vintage Fashionable PU Leature DSLR Camera Bag. Even though it’s spelled leature, this is referring to the PU leather that the bag is made out of. The leather construction provides serious strength and durability. Not to mention the fact that it looks amazing. Have you shown concern towards being a target of theft when carrying around your obvious camera bag? This one can help provide the security of transporting your camera inconspicuously. This bag is just perfect for carrying your expensive electronics around town or to the airport. Travel can become a leisurely experience when using this bag. You only need to take the padded camera insert out and let the rest of the bag roll down the conveyor belt. Since the plush lining is removable, you can feel free to use this messenger for more than just your camera. Your cell phone will fit in one of the front pockets, and an iPad or Kindle can fit in the roomier back pocket. With several colors of leather to choose from you can get one for every outfit or every occasion. For professionals, this can be a great satchel to use when going to the office. Bring it with you to your next meeting even. This bag is bound to turn a few heads. The metal snaps make this bag incredibly easy to open and close at any moment while still providing the support and security of standard buckled satchels. You can fit a large camera body and even a large lens with still having additional room for your other cords, and batteries. All in all, this is one of the better constructed messengers for toting around all of you things while looking great doing so. Its main compartment features sturdy, adjustable dividers, which make it easy to store and carry your equipment. Furthermore, these dividers are adequately padded. Therefore, chances of your gear crashing or bumping against each other are non-existent. The main compartment can hold a standard zoom lens and a DSLR camera. Furthermore, its padded sling strap rotates easily from the back to the front, thus giving you fast access to your gear. The strap is also padded, which means that it will create discomfort on your shoulder, regardless of the amount of time you carry your bag. This camera backpack for DSLR features a zippered side opening, which provides a convenient means of accessing your equipment. Unlike other bags, you don’t have to remove it and put it down. As a result, it will save you a considerable amount of time and effort. The side pocket can carry a small tripod while the additional small pockets can carry accessories such as batteries, and memory cards, among others. Maybe you are looking for a fashionable yet durable bag that will not let you down in a pinch. P.KU.VDSL-AUGUR SERIES Vintage Canvas Leather Backpack would be a great fit for anyone looking for a functional and reliable pack. This particular knapsack is made from canvas and has leather accents so that you will be the talk of the town. What if that is not all you are looking for? The vintage canvas pack can also provide you with the durability that you require. If you are planning to carry several bulky items around with you, this would be a match made in heaven. If you want to bring your camera gear and equipment, this bag will easily accommodate you. There is even added padding, so you will feel more comfortable having your electronics at all times. The shoulder straps are also padded to provide extra comfort for your back, neck, and shoulders. This bag comes in a wide variety of different colors. The design is a beautiful take on an old postal or military style sack. Since it includes drawstrings and magnetic snaps you will be double protected against anything falling out. Three main zipper pockets can be found on the outside of the pack. You can put your phone, wallet, snacks, or even drink in one of these pockets so that you can always have everything you need. If you would prefer to store your phone or anything like that for safe keeping, you can use one of the several inside compartments. So, if you are looking for something easy, simple, and attractive this is definitely a backpack that you should look into. Without a doubt, the Neewer Camera Case is one of the best camera backpacks for hiking, hunting, backpacking. It’s designed for photographers who are looking for a spacious bag, which can accommodate all their gear. It’s sturdy and durable. Furthermore, it provides a convenient and versatile means of carrying your photography equipment around, without worry about their safety. So, why should you purchase this camera backpack? Whenever you are out there taking photos or videos, your camera equipment is exposed to different elements, which can lead to damage. Therefore, you need a backpack that can protect and keep your equipment safe from all elements. And that backpack is none other than the Neewer Camera Case. It’s made of sturdy polyester and nylon waterproof material, thus making it ideal for outdoor photography. It’s interior is red while its exterior is black, making it aesthetically attractive as well. Access all your equipment is easy and fast, thanks to the front zippered flap. This camera backpack for travel, features a spacious capacity, making it perfect for carrying any camera and their accessories. Whether you own a Nikon or Canon, this backpack is compatible with all cameras. Besides that, it has ample room to accommodate a DSLR camera with an ordinary zoom lens. You can shoe-mount professional flash units. Also, it has enough space to store batteries, memory cards, mirrorless cameras, multiple lenses, and radio triggers. It also comes with tripod and monopod strap holders, which are secured with two side buckles. And since these features are upgradeable, you no longer have to decide what you should carry and what you should leave behind, since it has adequate space to accommodate your gear. The bag dividers are padded and customizable, to keep your gear safe from all forms of damage. Also, you can adjust the dividers depending on the size of the equipment you want to carry. Furthermore, the padded dividers prevent your gear from bumping against each other. And for additional space, you can use the mesh compartments, which have been fitted on the front lap of this bag, where you can store smaller accessories like memory cards and cables. Are you looking for something that will carry all the things you need while providing you with the hands-free style that typically only a backpack can give you? You might want to check out the WATERFLY Fashion Waist Pack. This waistpack is extremely convenient if you are constantly on the go either hiking, mountain biking, camping, or anything really. Fasten the straps and buckle it around your waist, so you will be ready for anything while remaining hands-free. It is a fanny pack style that fits around the lower back and can be swiveled around to the front without issue. You can carry two water bottles very easily and use the pockets to hold everything else. It will support your phone, first aid, sunscreen, flashlight, keys, wallet, sanitizer, and even a few snacks. With all the different pockets you can have your items basically all separated keeping them even safer. Using this travel pack while hiking or running is the most ideal. Since the straps are completely adjustable, there is no need to worry about the bag slipping off. When you’re in the middle of climbing a tree, this can come in very handy. The last thing you need is for your stuff to start slipping down to your ankles. The adjustable straps give this pack the ability to be worn by anyone of all shapes and sizes. Even children can wear this fanny style bag without it falling off. This waist bag is extremely comfortable to wear for long periods of time. If you are planning on going on an extended hiking or camping trip, this would be great to bring along with you. With multiple color options, there’s bound to be one that everyone in the family would love. Vivitar was able to construct one of the best camera backpacks for your DSLR. The wearable case is large enough to provide ample room for your DSLR with a zoom camera lens, as well as several additional lenses, your flash, and standard accessories. What Can This Bag Do? This case style backpack comes with adjustable and customizable dividers with padding. The foam inserts are extremely helpful so that you can mold and shape the compartments to fit your specific camera bodies and add-ons. Since it comes with several of these dividers, you will have sections small enough for even the tiniest gadgets to remain out of harm’s way. The bag is designed to come to a point at the top where the body of your DSLR will continue to stay safe. Keeping your camera from bouncing around while it’s on your back will extend its life. It also includes a security strap for extra safe keeping. In order to pack everything without difficulty, the bag will open entirely to show you all of its contents. Making it easy to pack and easy to grab on the go. Inside, there is a mesh zipper pocket where you can hold things like your memory cards or extra batteries. This pocket is big enough to store all of your smaller accessories. If all your items do not fit in this accessory pocket, there is another one on the side of the bag. So if you are tired of using your old style camera case, this is a great alternative option you can utilize. Overall this is a sturdy, reliable, and easy to use backpack any camera owner would love to own. If you are on the search for something super versatile and durable for hiking trips or camping excursions the KAKA Hiking Backpack could be the solution you have been looking for. Providing users with the ability to carry up to 40 liters and a max weight of about 4 1/2 pounds you can use this bag to carry just about anything. Making sure that everything inside remains as safe as possible; this is the ultimate tool for hikers and backpackers. Bring your electronics with you without feeling worried if they are okay. This great and versatile backpack can be a perfect addition to any explorers tech arsenal. There is enough room to carry a tablet, your phone, your computer, and still having plenty of room to spare. Using features you typically only see in a duffel bag this pack is considered to be a hybrid of a backpack and a duffel all-in-one. Due to the waterproof design, this bag is ideal for extended trips where you might end up getting caught in the rain with no shelter for protection. This can be very helpful in situations where you have nowhere to go but valuables that need to stay safe. Also utilizing several different handle options and its over the shoulder strap, you can wear it like a satchel, backpack, or even carry it like a bag of luggage. The shoulder straps are built with a soft, plush inner lining that will relieve stress on your shoulders and back. The wide straps offer even more relief from your neck. If you are worried about the bag bouncing around, you only have to fasten the waistband to provide more security for your things. Perfect for hikers and explorers, what are you waiting for? Have you been looking for a new hiking/camping pack that isn’t as heavy as your old one? You might be wanting a bag that will securely hold your all your things. That used to mean sacrificing a lightweight bag for much heavier yet sturdier one. That is not the case anymore. Since NeatPack released their Durable, Foldable Nylon Backpack, now you don’t have to choose between a lightweight pack and a durable one. When going out and hitting the trails, you can breathe easier knowing you will not be dealing with back pain or neck pain halfway throughout your day. Padded shoulder straps help provide additional support to keep your back pain free. If you find yourself in a situation where you need to bring your backpack separately, it will quickly roll up into a small pouch for easy storage when not in use. If you are planning on being in a busy area or among a lot of people, there is a secret compartment used for storing valuables. Flip the pack upside down, and you will see the zipper to help conceal your precious items. On top of that, there are additional safety latches that allow you to fasten the bags main compartment zipper to keep it from being easily opened. This will help keep you from becoming a victim of pickpockets and other forms of theft. Tear and water resistant nylon help keep your knapsack and everything inside safe and sound while remaining as dry as can be. Using additional reflectors in the construction will keep you safe at night from motorists and other drivers on and off the road. Overall, this nifty little device is a great purchase for outdoor and everyday use. The Mengar 35L Foldable Backpack has recently started increasing in popularity amongst travelers, backpackers, and even adventure photographers. This sturdy pack can hold up to 35 liters without issue. Since it is also extremely lightweight, it is incredibly easy to bring with you anywhere. If you are traveling, it’s ideal for fitting with your luggage. Just roll it up and zip it into its travel case for quick and easy storage. Utilizing an adamant and waterproof nylon fabric during its manufacturing, it can withstand a lot of wear and tear. A honeycomb style nylon will give you further security from rips or tears. With the reinforced bar to protect a bags usual stress points, it can give you peace of mind knowing that all of your items will remain safe. Innovative abrasion technology protects the metal zipper from falling apart or ripping off. Since this bag is just so lightweight and has thick plushly padded shoulder straps, any neck pain, shoulder pain, and upper/lower back pain will not become an issue. If you tend to deal with more back pain than most, this knapsack would be a perfect and comfortable fit for you. Basically, any and everything can fit in this bag. Any electronics you might have including a tablet, laptop, cell phone, or you can even pack your camera case inside. The backpack may look small, but you can fit many different items inside all at once. With additional pockets and cubbies for drinks, food, or snacks you will always have room for what you need. If you are looking for the ultimate backpacker’s travel bag, look no further. This wonderful knapsack will be a great addition to your next trip. The ORICSSON Outdoor Lightweight Daypack should be the first essential you purchase for your next extended vacation or trip. Offered in a wide variety of different colors you are bound to find one that fits your personality. This daypack comes with all the pockets, cubbies, and compartments you would ever need. Adjustable shoulder straps mean you can maneuver while wearing it more freely. What if you need to bring your backpack with you on vacation? Getting a large stiff knapsack to fit in your luggage used to be a problem. Now it no longer has to be a challenge to pack your pack. Since it uses a lightweight material in its construction, you need not worry about trying to jam all your belongings into your luggage. This can even keep your things and other valuable items from being damaged due to rough handling. Since the pockets on it are made with elastic, you can feel safe while stuffing this bag full. The 35-liter size means you can fit a plethora of items without causing harm. You can fit a couple of pairs of pants, several shirts, underwear, socks, travel size toiletries, medicine, keys, a tablet or small desktop, and still have room for all your camera gear. There are so many pockets and pouches that you can hold even more as long as you are strong enough to carry all your stuff. Since this bag is so lightweight, you can pack basically anything you can physically move. For professional explorers and amateur adventurers, anyone can find a great use for this bag. Even if you are just planning on going down to the grocery store, you will be able to carry it all back and forth with minimal effort. Ritz Gear™ Deluxe Premium Photo Sling Back is one of the coolest sling backpacks available on the market. For serious adventure and wildlife photographers, this bag has it all. There is storage space for a DSLR camera with the lens attached, an extra lens, flash, neck strap, SD cards, and several batteries. A mesh pouch connected to the side is meant to house a water bottle or can of soda so you can remain hydrated and hands-free. There is also a zipper compartment at the top for any of your personal items. You can bring things like your phone, wallet, or something to eat while still keeping everything secure. Having these other items stored safely away from your expensive and valuable camera gear, you can be on the go without having to check your bag every five minutes. Foam dividers can give you even more protection for your gadgets. Don’t stress whether or not your equipment is safe. The foam inserts and additional padding inside the bag will provide you with more protection. This backpack uses shock absorption so if you bump into something your items will still be intact. The coolest feature of this bag would have to be the slingback compartment. You do not have to completely remove your bag just to pull out your camera. Maybe you are in the woods, or next to a small creek and just can’t find anywhere to safely put your bag down. Just swing the slingback around to the front of your chest, so the side zipper compartment will quickly open right in front of you. Perfect for anyone with a constant on the go lifestyle, this is an exceptional tool for any photographer. Are you looking for a stylish, functional and durable backpack that has plenty of space to carry your photography equipment? Well, that backpack is none other than the USA GEAR Digital SLR camera backpack. It’s designed for professional photographers, who spend most of their time outdoors. This camera backpack for DSLR will protect your valuable camera equipment while providing enough room to store all your accessories. Unless you are going for a shoot that requires several different cameras and lenses, this camera backpack should be enough to accommodate all your stuff. It’s furnished with 5 different compartments, featuring padded dividers. Therefore, you can put all your gear in this camera backpack, without worrying about them bumping or grinding against each other. And since the dividers are adjustable, you can move them as you want, to accommodate your needs. For instance, if you have a camera that needs more support or one of the lenses is slightly bigger, you only need to adjust them accordingly and they will suit your needs. Outdoor gigs can prove to be a nightmare during wet weather. Luckily, this backpack for DSLR will protect your equipment from all forms of moisture. It comes with a rain cover, which provides an effective shield for your gear. Also, its exterior is made of nylon material, which is highly water resistant. As you can see, this backpack has enough features to protect your camera as well as its accessories against the elements. This camera backpack for hiking is designed to accommodate different brands and makes of cameras. If you use a Canon, Sony, Nikon, Panasonic, Pentax, Leica or Fujifilm DSLR camera, then you can use this bag. Its pockets are adjustable. So, if your camera is slightly bigger than others or the lenses are not fitting as you had expected, you can always move the dividers around and your camera, together with all its accessories, will fit. It also comes with several smaller pockets, which you can use to store miscellaneous items that you might need during your shoot. Most likely the coolest camera bag that Evecase has come out with would have to be the Canvas DSLR Travel Camera Backpack. With a knapsack design used with a modern twist, this bag has more compartments and pockets than you can count. You can literally keep every item in its own place. Several different Velcro and zipper pockets can house everything that you typically carry with you in your pant pockets. Wallets, phones, keys, there is space for everything. The specialized camera compartment will support a wide variety of different sized camera bodies making it extremely sought after. Professional photographers can use this travel-bag as a great every day carry around. Since there’s still room for your laptop, tablet, or notebooks, you can always have everything you need with you at a moments notice. Will this bag provide your back with the comfort of a smaller light weight camera case? The simple answers that question is, absolutely! With incredibly plush and padded straps for your shoulders, you can carry all of your heavy camera gear and feel virtually nothing while doing so. You can even hook portable lens cases to the D-rings on the shoulder straps for quicker access. Secret compartments around the outside of the bag will keep you guessing what you might find next. On the bottom of the bag, there are easy to adjust straps that you can fasten your tripod for safe keeping. Stop leaving your tripod at home. You purchased it with the intent of using it. So get the most out of your money and start bringing your tripod along to every shoot you go to. Finally, you can start using it to get the perfect shot every time. Since the camera inserts are removable anyone could enjoy using this bag. This amazing knapsack can be enjoyed by any and everyone, not just photographers. Even though this bag may not look like much at first glance do not let that fool you. The ibagbar Classic Canvas Backpack may look small, and like nothing special, however, it has proven to be a powerhouse amongst other canvas backpacks and knapsacks. Made from cotton canvas and including genuine leather accents, this bag would be a great accessory for any middle school, high school, or college students. Including six pockets altogether there is space for you to keep certain items away from any others. If you need something to fit a laptop or tablet, it comes with a pouch to help keep them from knocking up against each other while on your back. Extra strong zippers made from real real leather will not rip or tear after a few uses. This pack was made to withstand some rough handling. What All Can This Bag Hold? With a maximum capacity of 30-liters, it can definitely hold more than it looks. The cotton-canvas is also water resistant, so your electronics will remain safe even in a downpour. If you want to bring your camera equipment, you should still carry them in a secure case. You don’t want your camera gear knocking around into each other. That would be a recipe for disaster. With how large the bag is you should not have any problem merely fitting your camera case inside. If you plan on going to the airport with this knapsack, you can easily store it on the plane. Since it is the perfect size to use as a carry-on bag, it is ideal for vacations or traveling for work. Whatever you intend to use the rucksack for the stylish yet simple design will make you look good doing it. Both sides of the bag provide access to your camera gear. You can either carry it as a chest bag or hang it on your back. And if you want to remove your camera, it will only take a few seconds. Despite its compact appearance, its interior is spacious. It can carry one camera, a tripod, 3 lenses, as well as other accessories. Also, it comes with a rain cover, which means you can shoot in the rain, without worrying about equipment damage. This backpack is made of sturdy materials, which provide adequate protection for your equipment. For instance, it’s equipped with a breathable and shockproof mat, together with a concealed pocket. You can use these compartments to carry your work ID, gloves, data cables, credit cards, and other accessories. The shoulder strap is padded to minimize pressure on your shoulders. Also, you can adjust the straps according to your size. The bag’s exterior is made of high-density waterproof nylon, combine with a 3-layer nylon mesh. Whenever you are carrying your photography equipment with this bag, you are always assured of comfort, convenience, and safety. The super durable HEXIN Rated 20L/33L Lightweight Backpack comes in two sizes. One has a maximum capacity of 20-liters while the other has a max cap of 33-liters. Depending on how much you need to lug around, you are given a choice between a smaller or a larger option. Since it also comes in a variety of colors, you can choose whichever one best fits your personality. This bag is roomy and versatile; you can use it for almost any occasion. You can take it backpacking, rock climbing, hiking, or just wear to school. Whatever you end up deciding to use this pack for, it will prove to be robust and sturdy providing you with the utmost support for all your items. The shoulder straps are made from a breathable mesh material. Don’t stress if you are planning on using your bag in warmer weather. With these revolutionary designed straps, you will never have to worry about being uncomfortable and sweaty. In addition, they can also provide security by firmly locking into place where ever you end up adjusting them to. Extra mesh pockets give you a perfect spot to put your keys, cell phone, or sunglasses for quick and easy access. The tear resistant nylon material can keep all your items dry even in the wettest of weather. With bar reinforced points, it can withstand any damage you will put it through. You might decide that you want to pack this bag or bring it along with you while it is empty. If that ever happens, you can fold up the lightweight bag and zip it in its combined convenient case. This backpack is ideal for virtually any occasion. The ORICSSON Travel Lightweight Sports bag is an excellent choice for anyone with an active lifestyle. You might be looking for something to go on a trip or vacation. Whatever you might need this bag for you won’t be disappointed. Choose between the small or large sized bag to fit your specifications. This backpack is so light weight that the small is .46 pounds while the large bag is .5 pounds. The weight difference between the two is undetectable by human means. If weight is one of your concerns, that does not need to be a factor for this bag. Choose either one, and you will never know the difference. Artistic accents give this bag a touch of fun and personality. It also comes in a pallet of different colors for anyone to enjoy. If you were planning on using this bag for school or just taking it to the gym, it would be a great accessory. What Are the Features of This Backpack? As far as the functionality of the backpack, there are several different things that make this bag great. The water resistant nylon material will keep all of your stuff safe from moisture. The netted side pocket will hold most standard water bottles or a bottle of soda. Reinforced zippers and double stitching means this bag will withstand even the harshest of users. To make sure the bag will not randomly pop open, there are added buckles with adjustable straps that will protect all of your delicates and valuables. The main pocket would typically be used for things like additional clothing, toiletries, and any of your larger items. The GEARONIC Men’s Outdoor Vintage Canvas Military Backpack is an excellent choice if you are planning on going on an extended hiking trip or even if you are backpacking through Italy. This canvas military knapsack is made from superb canvas fabric that is extremely durable and long-lasting. The last thing you want while you are out on vacation is for your pack to rip or tear. What are you to do then? With this outdoor vintage canvas military bag that will not be an issue. Including leather accented straps to help keep the bag closed, you can feel very secure when choosing this for your next purchase. No one wants to spend money if they have to. So making sure that you do your research is crucial. Selecting a bag might not seem like a difficult task, but with all the different kinds that are out there, it is easy to pick one that looks good but won’t last very long. This particular bag is meant to hold up under pressure. Since the bag is large enough for even your laptop, you can use it for school or work if you want. One of the most common uses for this style of rucksack would have to be traveling. Due to its durability, it is perfect if you plan on being away for an extended period of time. Don’t forget to pack your camera along with your other belongings. You will want to make sure you have it with you to catch those special moments. Extra pockets around the exterior provide plenty of additional space for your phone, keys, and wallet. For your next adventure you will want to make sure you have the perfect adventures pack. That is exactly what this one can provide you. Are you a tech geek? Maybe you have been looking for something that will accommodate all of your different electronics. In that case, you should look into the Victoriatourist V6022 Laptop Backpack for SLR Cameras. With the ability to easily carry a laptop up to 15 inches this is ideal for any photographer or even a photo editor. Even with your laptop, your camera, and several of its accessories, you will still have ample room. Anything else you might need can go in the main compartment at the top of the pack. The camera portion will cradle your camera body with the lens attached and still have enough space for extra lenses. What if you do not need a photography bag? Just remove the camera insert and fill it with whatever other things you need. The additional pockets located all throughout the bag will give you more organization for pens, keys, phones, and other smaller items you will need to bring with you. Still having the ability to pack some folders and binders, this would be a match made in heaven for a photography student. Maybe you want to live the music lifestyle. You can store your phone or your MP3 player inside the bag keeping it safe. Using a small opening at the top of your pack for headphones, you can rock out to your jams while keeping your hands free of obstruction. What if You Sweat A Lot? If you tend to sweat a lot especially while wearing your bag around this one has a solution to offer you. With an airflow multi-paneled system in the back, you don’t need to stress the sweat stains. If you are a professional photographer, you need a camera backpack that is large enough to accommodate all your gear. It also needs to be discreet enough not to attract attention to what you are carrying. Well, that backpack is none other than the BAGSMART Anti-Theft Professional. This anti-theft backpack strikes a nice balance between style, utility, and safety. It suited for urban and outdoor use. Also, you can convert it into an ordinary travel backpack. This camera backpack for travel is made of durable and sturdy materials, designed to provide secure and safe storage space for your photography gear. The exterior is made of water repellent polyester. It also comes with a protective rain cover. Even if you encounter wet conditions during your shoot, you don’t have to worry about your equipment, as long as they are inside the bag. It’s also equipped with an anti-theft system, which provides additional safety and security for your equipment. The shoulder straps are ergonomically contoured, to ensure they rest comfortably on your shoulders, without creating unnecessary tension or pressure on your back. At the same time, the adjustable chest and waist straps minimize fatigue while enhancing the comfort levels of this backpack. This backpack can hold one DSLR camera, up to 4 lenses, notebooks or laptops, as well as tablets. It also comes with side holder straps, which you can use to carry a tripod or a mini tripod. Whether you are going for a hiking trip or you just want to capture some footage in the city, this camera backpack has all the space that you will need to carry your gear. Whether or not you intend to use this bag for your camera or just your books, the Ohuhu DSLR Digital Camera Gadget Organizer Bag has gotten many people talking. Being smaller and easier to tote around than most camera bags is a fantastic feature. On top of its portability, it is also inconspicuous for carrying around valuables like your expensive DSLR camera. This bag gives off the appearance of a messenger bag or large purse. Since this bag does not look like a standard travel case for a camera, it will significantly lessen your chances of being a victim of theft. When talking about precious items such as these you can never be too safe. Removable camera inserts make this bag extremely adaptable and terrific for everyday use for even regular things. A zipper at the top will completely close the bag, so you do not need to be concerned about your camera falling out. If you have a moped or motorcycle, this is helpful in providing added security. In addition, pockets around the front and the sides provide extra space for memory cards or batteries. There’s even enough room to store cords, chargers, and a smaller handheld digital camera. The buckles on the front actually latch close which is a pleasant surprise. As far as the inside the bag, you can store a DSLR camera body, multiple lenses, and a flash attachment. Since it comes in a couple of different colors, you can pick one that will best match your wardrobe. If you are sure before, hopefully, this has helped to influence a more informed decision before you purchase your next camera bag. If you are a true hiking aficionado like me, then you will know how good it feels to be carrying a multi purpose and lightweight backsack, which is able to withstand the elements. A good hiking rucksack must have multiple functionalities, it must be highly durable and you have to be able to depend on it. Your backpack is going to be your home while you are traveling the roads, the forests, the meadows, the mountains or whichever hiking trail that you’ve decided to go on. The longer you travel, the more important it becomes to have a really great backpack. This is especially true if you want to bring a video camera with you. Because it would certainly be a shame if you could not record all the beautiful scenery that you are going to encounter when you embark on your next epic hiking journey. Naturally, you’ll want to be bringing all sorts of stuff with you, but a camera is easily going to be the most sensitive piece of equipment in your pack. So for that reason, you’ve got to be sure to bring a really excellent hiking camera backpack with you, that you can rely on. Long distance hiking can be a true test of your mind and your spirit. A dependable rucksack can help you get through the whole ordeal. You should never rush into buying the first backpack that you lay your eyes on. There are things you must consider, such as the functionality, its material and its durability. Every trip has different requirements. The very first time that I set out to buy a really good backpack, I spent many hours walking around REI to check out all the goods. These guys know rucksacks. Since a good hiking video camera backpack is going to cost a pretty penny, it pays off to do your research. There are literally hundreds of backpacks available, from all sorts of manufacturers and in all sorts of styles and designs. It is definitely worth to invest in a higher priced backpack. You don’t want to go all cheapskate on this. If you go cheap on a hiking backpack, then you will likely have to buy a new one after about a few months. Cheap ones wear out fast. You need to view a good hiking rucksack as an investment in yourself. While you won’t have to spend $400 on a backpack for hiking, you should also want to avoid the $50 ones, as these will not give you the functionality and the durability that you so require and deserve. It definitely pays off to spend at least double that amount to get a high quality backpack from a trusted brand. Your backpack is going to be your new best friend for a long time to come. A long time ago, I bought an Osprey backpack, which has lasted for many years and I was always very content with it. I have taken this Osprey on many long distance hikes throughout the years. I still have it. It’s not in use anymore, but I know it has a few more years of lifespan left. There is an essential difference between traveling backpacks and hiking backpacks. It helps to learn the difference before you set out to spend your money on either. A travel backpack is sort of like a hybrid of a backpack and a suitcase. It has zippered side panels, which makes it look like a suitcase. Hiking backpacks are the actual backpack as most people imagine backpacks: top loading packs with a top lid, clips and straps for easy carrying. Some people like to get all purist and say that hiking backpacks can only be used for backcountry hiking and that they aren’t suitable for backpackers. But I’m not such a purist and I respectfully disagree with these people. Not only is every trip different, but every person is different as well. So whichever backpack is suitable for you and your trip is wholly subjective and comes down to your personal preference. Everybody has a different travel style. If you are moving from one motel to the next, then a travel backpack might be the right choice for you. A travel backpack gives you the ability to organize your gear really well. You can also use a travel backpack for a day hike or any other short distance walk you might want to undertake. However, the longer your hikes become, the more important it becomes that you start looking at hiking backpacks instead. Hiking backpacks are especially designed to make you comfortable on long hikes. The weight in them has a really good distribution, allowing you to carry it for longer. They are also tough, so they last long and they can take a punch. Hiking backpacks have other enhancements that you don’t see on travel backpacks. Think of load bearing straps, back and shoulder suspension, full sized hip belts, etc. All of this to make you more comfortable on your long distance hike, ofcourse. With a hiking backpack, you will be packing top down. So what goes in first, comes out last. That may not always be very convenient, but it is necessary to properly distribute the weight. And let’s face it… you’ll spend more time carrying the backpack, than you will accessing its contents. If you want easy access to certain types of gear in your backpack, then you would do good to buy a hiking backpack with a side load access. However, things aren’t as black and white as I have made them out to be. Some travel backpacks come with suspension systems that you normally only see on hiking backpacks. Some travel backpacks also have some pretty high range load capacity. But in my view, if you are looking at a 70L backpack, you may as well go for a hiking backpack over a travel backpack. You never know when you are going to have to go on your next 25 mile hike to the next base camp, town, or whichever your goal is. Ask yourself what travel style has your personal preference. Having to buy a different video camera backpack for hiking trips is going to be expensive. Figure out your own personally preferred style of traveling, and you’re going to save yourself a lot of time in the long run. Try to get one backpack to rule them all, and you won’t have to spend money on another one for at least the next 10 years. Let’s say that you enjoy going on trips that take on average 10 days. In that case, you don’t really need one of the most high capacity backpacks. You can easily do with a 50L hiking backpack. However, if you are fond of long distance hikes, then you will definitely want to buy a 70L backpack at the very least. While size is one of the most important factors for buying a rucksack, it most certainly isn’t the only one you ought to look at. Different people have different packing styles. Some like to really load up. Other keep it bare bones. Keep the following in mind. 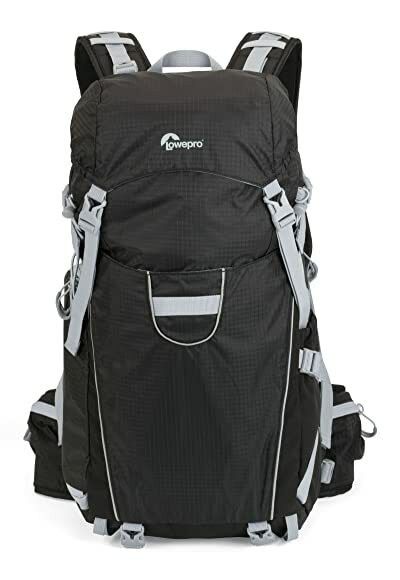 Depending on how long your trip will be, you are going to need a backpack with either a low, medium or high capacity. The shorter your trip is going to be, the lower the capacity you are going to need. The longer your trip is going to be, the higher the capacity you are going to need. It goes without saying that the more you load in there, the heavier your backpack is going to become. You may think that a mere 60lbs is a joke to your average adult person. But wear this for months in a row, and it’s going to become pretty heavy on you. I always like to go with one backpack that I can use for every single purpose that will come to mind. After all, you never know what you’re going to encounter when you travel a lot. You may disagree here, and that’s perfectly alright. My personal advice to you would be to still try and predict what sort of activities you will undertake, as this will help you make a good backpack pick. If you don’t want to be carrying it around all the time, then you may want to go with a travel pack that runs on wheels. However, if you expect to be doing long distance hikes on strenuous trails, then you will want to go with a hiking backpack for sure. Being the natural born hiker that I am, it won’t surprise you to learn that I am heavily biased towards hiking backpacks. I want to be ready for any activity that comes in my way. Hiking backpacks have the advantage of being much tougher and much more highly durable than any other backpack out there. Hikers take on some pretty challenging physical activities, such as jumping from one rock to the next across a stream, or sliding down hills and taking lots of tumbles and whatnot. This will place stress on the backpack, so durability is important for hikers. Will You Pack Light Or Heavy? While the capacity of a backpack is not everything, it is still a very important factor to consider. So be sure to think about what you are planning on bringing with you on your next hike. If you want to be packing as light as you possibly can, then you will want to avoid a high capacity backpack. If you are carrying a high capacity backpack when you intend to pack light, you will accidentally bring along too much stuff. Or if you end up packing light anyway, your high capacity hiking backpack will not be able to distribute the weight evenly. On the other hand, if you want to pack heavy and all you’ve got is a small capacity hiking backpack, then you are never going to be able to fit in all your stuff. For this reason, it is very important that you really think about the capacity of the rucksack that you are taking with you. If you are buying a backpack offline (yeah, it’s ridiculous… I know), then you have the option of bringing your stuff to the store to see how much of your gear you can fit into your backpack. Most serious retailers will not have a problem with you trying out the merchandise before you buy it. What Features Does A Hiking Backpack Need To Have? There are plenty different kinds of backpacks, varying in all sorts of appearances as well as functionalities and features. The higher the price you are willing to pay, the more features you can expect your backpack to have. You have really got to think about what sort of traveling you intend to do, before you go out and buy one. No backpack is ever going to be completely waterproof, in the sense that no drop of water will get inside of it ever. Every backpack is going to let water in when it becomes submerged in water. Or you may have bad luck and get one of those torrential downpours that will manage to creep into your backpack from exactly the right angle. Most backpacks for hiking that I have seen, are fitted with a so called rain cover. That certainly helps. But next to a rain cover, you want your backpack to be rip proof. It has to be made of a tough material, such as lightweight silicone coated nylon. There is also a material called Cordura, which is known to resist water drops, letting them slide right offer, rather than letting them soak right through. A removable (or detachable) daypack, is an extra backpack that you can strap to your regular backpack. It’s like Xzibit came along and pimped your hiking gear: “Yo dawg, I hear you like wearing a backpack while you’re wearing a backpack, so we put a backpack on your backpack.”. It’s like an additional pack for short trips. I really like to have this option on a backpack myself. If you are a light traveler, then two bags might be overkill for you. So in that case, you may not want to go for this option. I really like having a detachable daypack myself, because I often go on long distance hikes and often find myself in need of having to pack moderately to heavy. The old Osprey I used to have, there is a top lid which can also be used as a daypack. It’s a tad bit cumbersome to have your pack lid also function as a daypack. But it has definitely had some good use though. Having a tough backpack is nice, but if it’s got a weak spot… then arguable, the whole backpack is weak. It does not matter how tough, rip proof and highly durable the backpack’s material is. If zippers and other attachments are weak, then the whole bag will end up disappointing you in the short term. It certainly helps to have lockable zippers, which are well made and not easily broken. The way I see it, the more compartments you’ve got, the better off you are. You will want as many places you can get to store all of your gear. You do not want to constantly be sifting through one layer of stuff after another, just to find your video camera. It helps to have all sorts of compartments and pockets all over the bag. Imagine how easy it would be to be able to store your smartphone and camera in a few side compartments, while storing your maps into yet a separate flap. If you want to have quick access to your stuff, then side pockets are something you can not afford to miss out on. If you are going for optimal comfort, then you will want a backpack that you do not have to take off when you want to access your stuff. The higher priced backpacks have very well placed pockets, such as around your hip area. These can be accessed without having to take off the pack. Talk about convenience. Lots of video camera backpacks for hiking these days, come with a frame. This can be either an internal frame or an external one. Some don’t have a frame at all. I personally highly prefer a lightweight internal frame. It will have to be lightweight for obvious reasons. But if it is not strong, then it is just dead weight. Good lightweight internal frames are made of carbon fiber. These give you great load support and they also look pretty darn good. External frames are an eye sore and very tedious to work with. They make use of old fashioned materials, which aren’t nearly as lightweight or strong. Frameless backpacks are no better, since they are unable to support a load at high weights. Weight distribution is incredibly important, or your shoulders are going to have to do all the work. And there’s nothing worse than having one part of your body bear all the weight. I see new backpacks entering the market all the time, and most don’t have any side load access anymore. I wonder what causes this trend, because having access from the side is so incredibly handy. With side load access, you can access the main storage space of your bag without having to go in from the top. I’m sure you understand this can save much time and energy. You’re hiking life gets one heck of a lot better with side load access. Any backpack worthy of its name, must have a suspension system, whether it be fixed or adjustable. There must also be a few good load bearing straps on there. The padded shoulders connect on the part of your back where the pack rests while you are wearing it. This part is also the suspension system. A fixed suspension system is fit to a single person’s torso. But one size does not fit all. So I always advocate an adjustable suspension system, which can be configured to your personal torso size. A suspension system’s purpose is to stabilize your gait by stabilizing your load. Much of the weight is transferred to your hips, which are closer to the ground than your torso. Your center of gravity becomes lower, making your more stable than when it were placed higher. What you often see on good backpacks worth their salt, are sternum straps. These are a type of load bearing straps that will make carrying the pack much more comfortable. They move the weight around and minimize and pain that you might suffer from carrying it for a long time. Nothing is more annoying then carrying around a sweaty backpack. So make sure that yours comes with proper ventilation. There needs to be a permanently breathable layer between the backpack and your back. Internal frame packs are usually outfitted with a design that encourages a good airflow. It will not make it easier on you to carry the load. But not having a sweaty hiking rucksack can certainly make your hike a whole lot more comfortable. Your hips are going to be carrying around 75% of the total weight of your backpack. So this is arguable the most important thing to keep in mind when buying a good pack. Your hip belt must always have padding. It it doesn’t, the pack’s ability to distribute loads is going to suffer. It will also lead to great discomfort and premature exhaustion. The hip belt should not just be a thin strap with a clip attached to it. It has to be a full size strap, with padding all around it. It’s the only way to get the best comfort for yourself. These will not make you more comfortable, nor will they help you distribute your load. These may not be the most important features on a backpack, but I still like them a lot. It’s great to have a whole bunch of excess clips, tool attachments and straps. It’s always better to have too many than too few. In true MacGyver spirit, your backpack is not just a simple bag… it’s going to be a tool belt. You never know what situations you are going to encounter. You never know what’s going to need fixing. You will be able to fix all sorts of things without the need for carrying more gear than you already are. A new trend in hiking backpacks are so called “daisy chains”. You will find these more often on mountaineering and climbing backpacks than you do on backpacks for hiking. They are basically just a series of attachment loops for tools. It’s a simple concept, but oh, so handy. This is a compartment that can hold your Platypus, Camelpak, or any other hydration bladder that you prefer. It can definitely come in handy to have hands free access to your drinking water supply. You don’t want to dehydrate yourself on your journey. This is a really great feature for long distance hikes, since you will be able to easily access the sip tube through the openings in your backpack. The average person will want to be sipping water constantly when they are hiking, because it’s a very physically demanding activity, which can dehydrate you if you are not careful. What Questions Do I Need To Ask Myself When Finding The Best Backpack? This is a very subjective issue. It depends on so many factors, such as the weather you are expecting, the length of your trip and the style in which you like to travel. For instance, if you are expecting cold weather, then you will need a rucksack with high capacity. The higher its capacity, the more heavy it will weigh. I strongly prefer packing light myself. I make sure to only put stuff in there that actually fits. I don’t like to over stuff. Think long and hard about what sort of capacity you need in a backpack. Lay out your stuff on the bed or on the floor and have a good look at it. Put it in a plastic sack to see how much volume it will take up. Check out my recommendations below. A video camera hiking backpack needs to have a really great fit in order for it to be able to distribute the load properly. If you can, try out the backpack before you buy it. But even when shopping in a regular brick & mortar store, this is not always allowed. Finding a well fitting backpack, requires you to know your torso length. This is not the same as your height. Your torso length is the distance between your iliac crest and your 7th cervical vertebra. In layman’s terms, this is the distance from the top of your hip bones to the base of your neck. With these measurements in hand, follow the following guidelines. Your torso length is the most important bit of information here. You don’t really need to know your hip size, because most hip belts are completely adjustable anyway. You do need to make sure that the hip belt sits comfortable between your hips and your belly button, with about an inch of space in between. What Should I Spend At Most On The Best Video Camera Hiking Backpack? There are backpacks available from low prices such as $50. But these are not durable and severely lacking in features. The real backpacks start at $100 and go as high as $500. It all depends on how much you are willing to invest. What’s more important to you, your money or your lifestyle? If you are well off, or are simply very willing to invest in the best rucksack you can get your hands on, then it really isn’t necessary to spend more than, say, $275. I would also stay away from anything that is significantly below the $100 mark. Anything below this price point is very unlikely to have all the necessary features for serious hikers such as you and me. Think of padded hip belts and suspension systems. You really do need to see buying a backpack as an investment. A $50 backpack is usually a waste of money, since you will almost always have a seam ripping or a strap tearing off after only a few weeks of use. A good backpack for trekking should definitely have good padding and good suspension. It just needs to fit comfortable and distribute the weight evenly. What Are Some Of The Best Hiking Backpack Brands? There are literally dozens of brands out there. There are so many designs, models and styles out there, it’s not even funny anymore. I do have my preferences, ofcourse. But one guy can only try out so many backpacks in his life, you know what I mean? I have tried out more than a few in my lifetime and I’ve also had a look at friends’ backpacks. Naturally, my old Osprey is a really good one that I would recommend. But I also really like the ones from Teton Sports, High Sierra and Modovo. These are high quality brands and they will withstand quite some abuse. It does not matter how roughly an airline attendant treats your backpack, or how hard you slide downhill with it. You’ll never see a clip, strap, zipper or any other attachment tear off these bags. They hardly ever need replacement. Some manufacturers offer lifetime warranties on their bags. It only goes to show how confident these people are in their own products. I seriously doubt that I will use any one bag for more than a decade. But it is still nice to know you’re buying quality goods for your hard earned money. These guys have been around since the mid nineties at the very least. Maybe they were in existence sooner than that, but I wouldn’t know about that, because I wasn’t hiking back then, nor did I have an Internet connection at the time. But I do know this… High Sierra makes some of the best darn backpacks I’ve never seen in my life. I currently own their Appalachian backpack and I could not be happier. They sell outdoor gear all across the world! In comparison to the other manufacturers, Teton is very new to the outdoor gear game indeed. On their website, it is listed that they started out in 2005, meaning they are precisely 10 years old at the moment of writing. This is very young in terms of outdoor gear manufacturers. But you’d never know it from the quality of their stuff, which is extremely high. They are a company with few clients and low overhead. Simplicity seems to be the key with Teton. Very little is known about these guys. I have investigated them on Google Trends, and they look like they are really new to the game. Their products have quickly become quite popular, due to their very decent quality. Maybe they are a daughter company of some other company on this list? I have Googled these guys for 15 minutes and I can’t find anything about them. If anybody knows more, be sure to shoot me an email. These guys have well over 4 decades of experience in the manufacturing of rucksacks. They offer a lifetime warranty on their products. These guys have a very large offer of designs and sizes for all sorts of outdoor adventures. They always make sure to use the latest technology for the manufacturing of their backpacks. This is a trustworthy brand that will not disappoint you. Another great manufacturer that has specialized in backpacks and nothing else. I have a friend with a Gregory backpack, and I’ve never heard him complain about it once. He’s been using it for as long as I can remember and he recently mentioned that he never needed to have it replaced, or even repaired. These guys also offer a lifetime of warranty for their products. The North Face is perhaps one of the best known outdoor gear brands out there. They’ve been in the business for well over 4 decades now. Another great brand that is trustworthy. I can’t really think of any criticism on these guys and their excellent, highly durable products. So that includes their backpacks. These guys are perhaps one of the coolest brands out there. They produce some seriously nifty outdoor gear. They are fairly pricey, but the truth of the matter is… you do get what you pay for. You are certain to get high quality gear when you shell out for Arc’teryx stuff. This is where the quality is starting to go downhill a bit. These guys are a typical mid range brand. You get decent functionality for a decent price. For some reason, this brand has become very popular in Europe. They have been manufacturing backpack equipment since the late sixties. There is a different between being water resistant and water proof. Most backpacks are water resistant, in the sense that water drops bead off the material. But water proof is a whole ‘nother story. If a backpack is not water proof, then constant exposure to the rain will eventually get your stuff wet. So if your backpack is not water proof, then you may want to get a rain cover to protect your stuff from getting soaked with the first surprise downpouring you encounter on your hike. When it comes to rain covers… you really don’t need to be taking out a second mortgage on the house for this one. All you need is a rain cover that matches the size of your pack. Take REI’s Ducks Back Rain Cover, for example. That one works perfectly well for me. If you are worried about your backpack getting damaged when you haven’t even set one foot on the trail, get an airporter bag. Even the sturdiest of bags can become damaged when they are being handled roughly by nonchalant airport personnel. Exposed straps, hip belts and zippers can be torn off when they get caught behind something. An airporter bag is a bag to place your bag in. It will keep your bag safe from harm while it is being transported. If the airporter bag gets damaged, it is not so bad. Keeping your hiking backpack in good shape is much more important. Good airporter bags will also offer the option of putting a lock on the zippers. This can deter would-be thieves from getting into your personal stuff and stealing it. Take the Osprey Airporter LZ, for example. It adds a bit of extra weight to your existing load. But to me, it’s totally worth it. I want to be sure that my backpack is safe and that it will not be rummaged through or damaged on my way to my next hiking destination. 1 Why are Camera Bags Important? 1.1 How Does a Professional or an Amature Photographer Deal With These Problems? 1.2 What Should You Keep in Mind When Traveling With Your Camera? 1.3 Don’t Forget To Grab Your Camera! 2 What Can a Photographer Do to Prepare For Poor Weather Conditions? 3 What About Those Who Hike Through Rough Terrain? 10 Will You Pack Light Or Heavy? 11 What Features Does A Hiking Backpack Need To Have? 12 What Questions Do I Need To Ask Myself When Finding The Best Backpack? 12.1 What’s My Recommended Size? 12.2 How Do I Find The Right Fit? 12.3 What Should I Spend At Most On The Best Video Camera Hiking Backpack? 12.4 What Are Some Of The Best Hiking Backpack Brands?